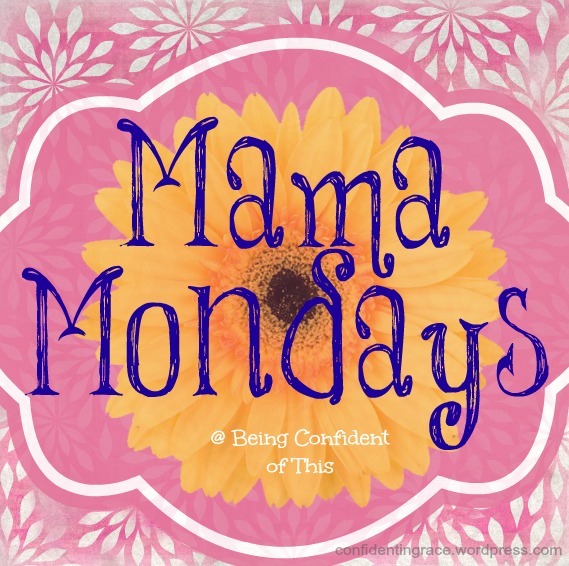 As promised in last week’s Mama Mondays post on Pre-K resources for homeschooling, I have some color learning activities to share with you today. 🙂 I did not spend a penny on creating these activities and probably only spent an hour or two of my time. Unfortunately, the laminating machine and I did not get along at first, so it took a little longer. If you do not have access to a laminating machine (I used our church’s), check with a local church or library. And learn from my mistakes – practice on some scrap paper first. Also, you might consider using clear contact paper as an alternative. On pinterest, I saw an idea for cutting activities using paint chips from the store, similar to this color matching activity. So, the next time my husband went to the hardware store, I asked him to pick some up. Instead of the variegated kind, he brought home solid colors, but he did remember to get several of each. Since they weren’t the kind I wanted for cutting practice, I decided to make a Color Go-fish game out of them. The samples themselves were pretty flimsy, so we glued them onto card-stock. If you don’t have card-stock on hand, try using index cards. The twins were happy to practice using their glue-sticks, and I was glad for an adhesive that dries quickly. If you don’t plan to laminate them, I would use a better adhesive, though. I was already planning on doing some laminating, so I decided to laminate them as well. Now they’re practically indestructible, which is good for our son. 🙂 Our daughter picked up on this color learning game rather quickly, but our son is still learning the rules and the right questions to ask. They both really enjoyed it, though, and have asked to play again since the first time we played. Color Go-Fish is a really fun, hands-on way to learn colors, and we’ll probably use it for shapes, numbers, and letters as soon as I can make up more cards. Our son lacks interest for much table work, so I’ve been searching for some more active ways to practice shapes and colors. One neat idea I found on pinterest was to use masking tape to make shapes on the floor. However, since I want to work on colors, as well, I decided to cut out large shapes from colored card-stock and laminate them. Then, we put them out on the floor and say, “Hop on red!” or if you want to include the shape as well, you could say, “Hop on the red heart!” Since we have two preschoolers, I’ll probably give each child his or her own turn so that they don’t fight over the shapes. Once we practice colors, then we use the same activity to practice shapes. 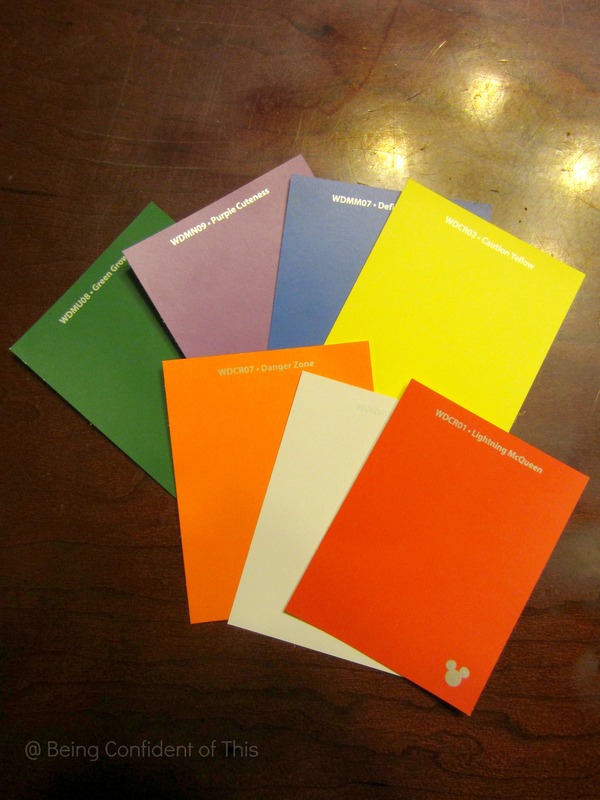 My husband picked up enough paint chips that I had extras once I made the Color Go-Fish game. 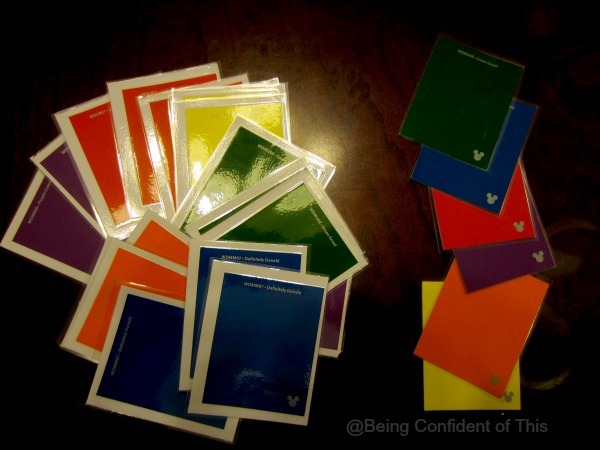 I decided to laminate the extra set and use them for color sorting. At the moment, all we had to sort were some colored pom-poms and some beads, so I had our second-grader use one of my scrap-booking paper punches to punch out stars from the leftover shape paper scraps. He had a lot of fun using the punch and now I have stars for our preschoolers to color sort, as well! Last week we focused on the color green, and this week we plan to focus on the color blue. For our daughter, who already understands color, I’ll do more patterning activities to give her more of a challenge. You may find me linking up at any of these lovely blogs. I love the idea of the colour hop game. My little boy is also very active and would love this. I could also try it with numbers/letters too. Brilliant! Yes, it’s been a big hit in our house. In fact, our son wasn’t too happy when it was time to put the game away. I’m glad you stopped by! I’ve used paint color palettes for years with Montessori style activities for our little ones… well, the original little ones aren’t so little anymore (one is grown and married) but the latest little ones are loving them, too! I’m hoping to create even more activities using color palettes. It’s nice to have frugal options for homeschooling! Thanks for stopping by. Thanks for sharing this over at WholeHearted Wednesdays this past week. Have a wonderfully blessed week. Thanks, Judith! I hope your week is full of blessings, too! Thanks, Sabrina! I appreciate the feature! Thanks for stopping by! I love the pin-it party – so many good ideas in one place.